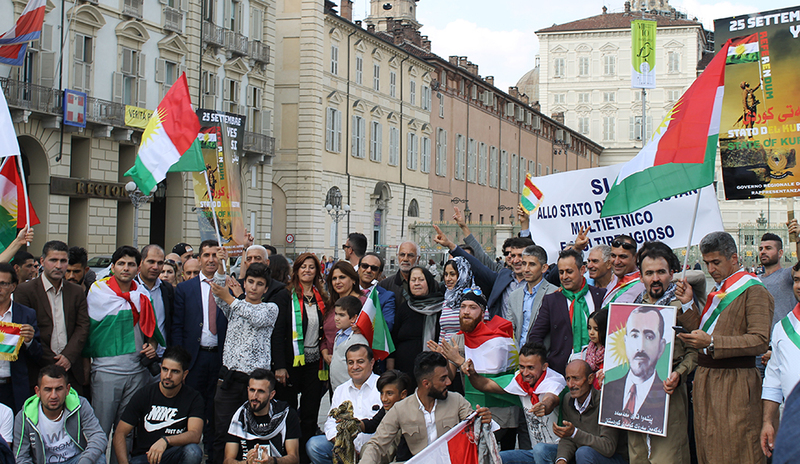 A peaceful march for the independence of Kurdistan, organized by the Representation of the Kurdistan Regional Government in Italy in collaboration with the Kurdish community resident in Italy, took place on last September 16 in the city of Turin. The High Representative Mrs. Rezan Kader welcomed the participants from various Italian regions to the Kurdish restaurant “KIRKUK” where a refreshment was set up to celebrate the referendum that will take place in Kurdistan on September 25th. In marching to Piazza Castello, demonstrators from the Kurdish community and members of the Italian Parliament exposed several slogans claiming a multiethnic and multi-religious state of Kurdistan and respect for their rights to self-determination after centuries of suffering. Mrs. Kader intervened by emphasizing the importance of this referendum for the country, which in 25 years has succeeded in building a rule of law, democratic, respectful of all ethnic components, and the values of peaceful coexistence, which has fought alone against Daesh and that is therefore ready to break away from an Iraq that has never respected the Constitution by violating the principle of partnership in all its aspects. In support of Mr Kader's position, Hon. Umberto D'Ottavio which invites not to fear the position of many countries defending the Middle East's status quo and against the referendum in Kurdistan. He therefore wished everyone a good referendum, confident that such a change in the area will bring stability and peace. In the hope that the will of the Kurdish people will be respected, we are looking forward to the votes with a large amount of trepidation.